Meanwhile in russia... The AKDrone! Meanwhile in russia… The AKDrone! In Soviet Russia Drone shoots you… seriously. This is probably the most russian thing we have seen in awhile. 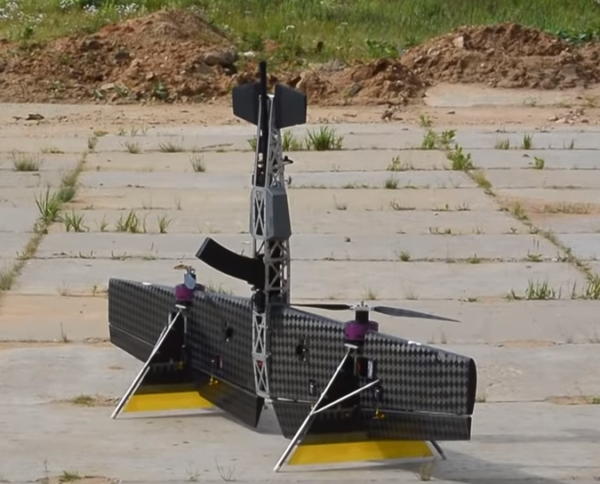 An arms manufacturer in Russia has built a drone around the infamous rifle. It does not appear that the aircraft is equipped with a First Person View Camera which leads us to believe that the pilot is guessing for the most part on aiming the device. As far as effectiveness. See the videos below and see for yourself. Additionally the airframe was not designed for the AK47 but rather the Vepr 12 gauge shotgun. The fact that the air frame can handle the recoil from the shotgun is pretty impressive. But other than that it does not seem to be a very effective platform. Thats not the point here. Its a FLYING AK! I sure many of you are asking does it shoot? It can even be used manually should the need arise! According to Funker530 Almaz-Antey a russian arms manufacturer built the drone around the AK Style shotgun. The drone can be seen in the video engaging multiple targets ranging from a balloon to another remote aircraft. Beach Visit Nearly Kills Family!